Children with disabilities will have significant differences in how they approach play and what they will experience during that play. They are limited in their ability to participate in self-initiated and self-regulated free play. 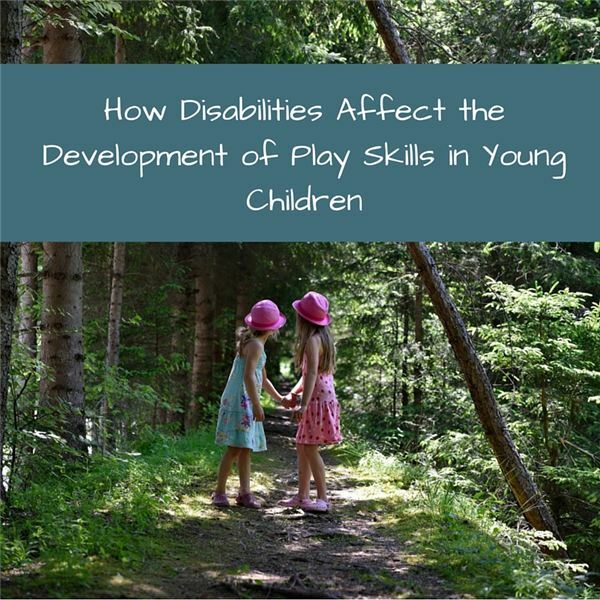 This can cause an impact on their physical and cognitive development and will impair their ability to function independently and in their overall growth and development. Physical disabilities may affect the child’s approach to play in a number of ways depending on how the disability limits his or her movement. Difficulty moving and manipulating materials in a constructive way and restrictions in moving to materials of choice limit the child’s ability to engage in creative and independent play. Without this experience, children cannot explore cause and effect relationships, trial and error experiments or early problem solving. An adult may need to give a higher level of guidance and support in order for the child to explore and actively participate. Providing materials that are switch-adapted or presented in such a way to ensure access will increase the child’s ability to participate. Children with limited vision have difficulty with exploratory and imitation skills. It may be more difficult to understand proper use of materials due to limited observation opportunities in their environment. Early object exploration, such as putting things in their mouths, may be observed. Children with hearing loss may not be able to respond to initiations by others and may be perceived as uninterested in playing or interacting. Opportunities for social play may be limited due to this lack of responsiveness. Giving opportunities for textured materials, objects being presented against a simple, black background or providing picture cues can help a child make self-initiated choices during play opportunities. The development of play skills is also effected by delays in cognitive functioning. Many repeated opportunities to imitate a specific play skill are needed before children are able to perform this skill independently with any personal meaning. Repetition of functional use of toys or objects must be modeled and supported by the caregiver. Hand-over-hand support may be necessary to teach these skills. Children with cognitive delays learn best from the use of concrete objects representing real world concepts. Using tangible objects and talking through the activity with simple language helps kids make sense of what action is taking place and why. Dramatic play may be difficult due to the abstract thinking involved with pretend play. Also, children with cognitive delays tend to remain in the exploratory stage of play for a longer period of time before they can move to the next stage of development. They will follow the same sequence in their development, but may move through the developmental stages at a slower rate. Difficulties with speech and communication inhibit a child’s ability to interact and initiate play with peers. Social interaction is a development domain in which children with disabilities may not have access to as frequently as typical children do. Observing, turn-taking, and spontaneously communicating his or her wants and needs comes naturally to a typical child, yet is extremely challenging for a child who is non-verbal. Language and cognition are closely related. This may cause a decrease in the child’s ability to describe, extend or express ideas during free play. Simple wants and needs of the child are difficult to express without some sort of modification and support from an adult. Wait time and adaptations such as using picture cues to help the child to communicate information is beneficial. An adult’s job is to observe and plan accordingly, adapting environment and materials to ensure active participation of all children of all abilities. Ensure children are making choices and expressing their wants and needs through pictures or objects and adapting materials to make them accessible for children with challenges to provide play experiences for all children. Missiuna, C. & Pollock, N. (1991). Play Deprivation in Children with Physical Disabilities: The Role of the Occupational Therapist in Preventing Secondary Disability. The American Journal of Occupational Therapy, 45(10), 882-888. Trawick-Smith, J. (2014). The Physical Play and Motor Development of Young Children: A Review of the Literature and Implications for Practice. The Center for Early Childhood Education. Eastern Connecticut State University.